Dave Aquino was born an only child to Atty. Gregorio Duque-Aquino Jr. of the Duque Clan of Pangasinan and Lida Viloria-Cacanando Aquino of La Union. He currently teaches law subjects to several educational institutions and currently serves as legal and political consultant to several institutions and personalities, both here and abroad. In late 2008, he was appointed by the Supreme Court as a Member of its Sub-Committee on the Revision of the Rules on Criminal Procedure. He has authored more than 35 law books, some of which are “Introduction to Law”; “The Dangerous Drugs Act of 2002: Annotated”; “CONSTI: An Outline of the 1987 Philippine Constitution”; “The Tax Navigator: A Casebook”; “Criminal Law: First and Revised Editions”; “Corporation Law”; and “Alternative Dispute Resolution”, to mention a few. 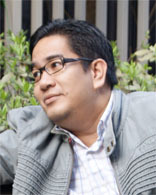 Prior to returning to the private sector, the author had served in various Director-level positions in several agencies of the Philippine government such as, among others, the Philippine Senate, the House of Representatives, the Supreme Court, the National Police Commission, the Philippine Drug Enforcement Agency. Aside from writing, the author also served as musical director for several schools and church chorales.